A young couple with matching expressions stare nervously into the camera with deep brown eyes. He, a Vietnamese student, has just met the love of his life. She, a North Korean, is forbidden to love him back. 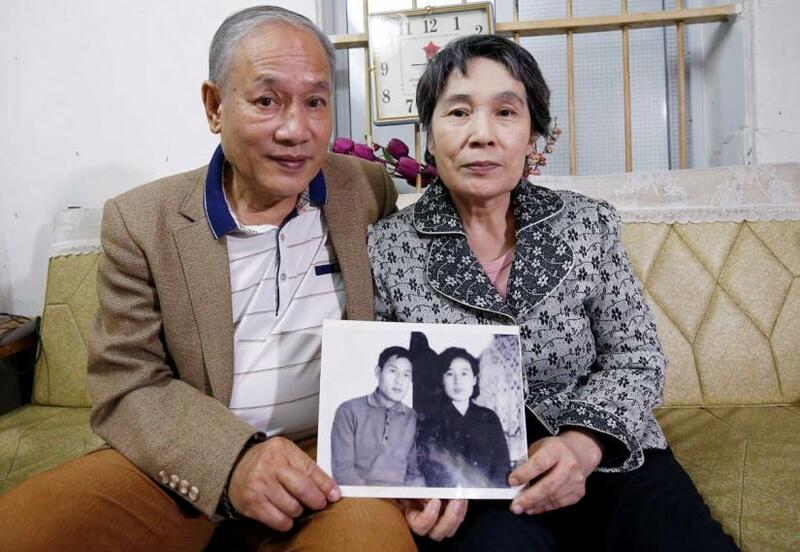 It was 31 years after Pham Ngoc Canh, 69, took that first photo of Ri Yong Hui, before the two were finally allowed to get married in 2002 when North Korea took the rare step of allowing one of its citizens to marry a foreigner. "From the moment I saw him, I was so sad because I felt it would be a love that could never be realised," said Ri, 70, speaking from the small Soviet-era apartment she and Canh share in the Vietnamese capital, Hanoi. Now enjoying freedoms in Vietnam that would be impossible in North Korea, Canh and Ri are hoping the upcoming summit between U.S. President Donald Trump and North Korean leader Kim Jong Un in Hanoi will help end hostilities with Pyongyang. Today one of Asia's fastest growing economies and integrated into the international community, Vietnam has been touted as a model for isolated and impoverished North Korea to follow. Back in 1967, as Vietnam and the United States were locked in war, Canh was one of 200 Vietnamese students sent to North Korea to gain the skills the state needed to rebuild itself once the war was over. Several years later, during a chemical engineering apprenticeship at a fertiliser factory on North Korea's east coast, Canh spotted Ri working in a laboratory. "I thought to myself, 'I must marry that girl'," said Canh, who eventually plucked up the courage to approach Ri and ask her for her address. Ri obliged: Her friends had told her one of the "Viet Cong" working at the factory looked just like her, and she was curious. "As soon as I saw him, I knew it was him," said Ri. "He looked so gorgeous". "Until then, when I had seen so-called handsome guys I hadn't felt anything, but when he opened the door, my heart just melted". But there were challenges. Until this day in North Korea, and in Vietnam at the time, relationships with foreigners are strictly forbidden. After the couple exchanged several letters, Ri agreed to let Canh visit her at home. He had to be careful. A Vietnamese comrade had been beaten when he had been found with a local girl. Dressed in North Korean clothes, Canh embarked on the three-hour bus journey and two km walk to Ri's home - a trip he repeated monthly until he returned to Vietnam in 1973. "I went to her house secretly, just like a guerrilla," said Canh. Upon his return to Hanoi, Canh felt disillusioned. The son of a high-ranking cadre, Canh refused to join the Communist Party, forgoing the bright future the state had planned for him. "I just couldn't agree with a socialism that stops people from loving each other," Canh said. Five years later, in 1978, the Vietnamese chemical engineering institute Canh was attached to organised a trip to North Korea. He asked to join, and managed to meet Ri. But every time they saw each other, Ri said, she became more heartbroken at the thought that they might never meet again. He had brought with him a letter he had written to the North Korean leadership, begging for permission for them to marry. "When she saw the letter, she asked: 'Comrade, do you intend to persuade my government? ", said Canh, who never sent the letter and instead asked Ri to wait for him. Later that year, Vietnam invaded Cambodia, triggering a border war with China. With North Korea on the side of Beijing and Phnom Penh, the couple stopped writing. "My mother was crying while caring for me," said Ri. "I think she knew that I was lovesick." In 1992, Canh again managed to get himself on a trip to North Korea as a translator with a Vietnamese sporting delegation, but couldn't meet Ri. When he returned to Hanoi, Canh found Ri had sent him a letter. In the late 1990s, North Korea was gripped by a devastating famine and a desperate delegation from Pyongyang visited Hanoi to ask for rice. Vietnam, which by then had undertaken major economic and political reforms and re-engaged with the West, refused. Canh was so concerned for Ri and her people that he raised seven tonnes of rice in donations from friends to send to North Korea. It was an act of generosity which finally paved the way for he and Ri to reunite: The North Koreans learned of Canh's act and agreed he could marry Ri and live in either country - provided Ri maintained her North Korean citizenship. In 2002, the two finally married in the Vietnamese embassy in Pyongyang, and settled into their new life together in Hanoi, where they still live today. "In the end, love beat socialism," said Canh.